When someone says “Beep Beep”, the first thing that comes to mind can be generational. In my age group the Road Runner (cartoon or Plymouth) is usually that first thing. OK, that one was really “Meep Meep”, but let us not quibble. However, for those a little older “Beep Beep” reminds people of the “little Nash Rambler” of the 1958 novelty hit “Beep Beep” by the Playmates. But this older association will come to all of your minds today as we take a look at this surprisingly successful compact car. Quick: What is the oldest passenger car design in production in the U.S. in 1958-60? Most people would have guessed the Studebaker, and they would not have been far off. There was also the Willys Jeep station wagon, but it was more of a truck than a passenger car, so it doesn’t really count. The answer might be this curious little Rambler. 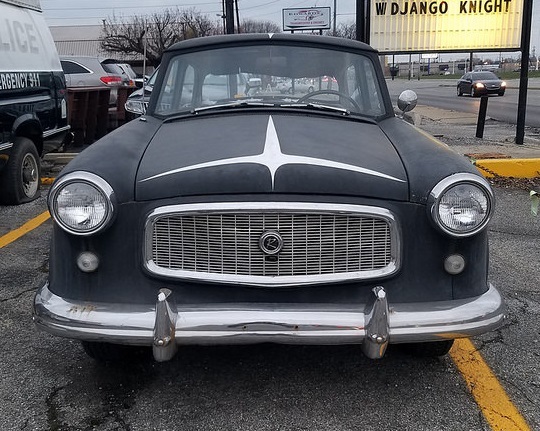 Originally introduced in 1950, the Nash Rambler was one of America’s first postwar attempts to sell a compact car to American car buyers. In those pre-American Motors days, Nash decided that trying to sell a small cheap car was not the way to go. 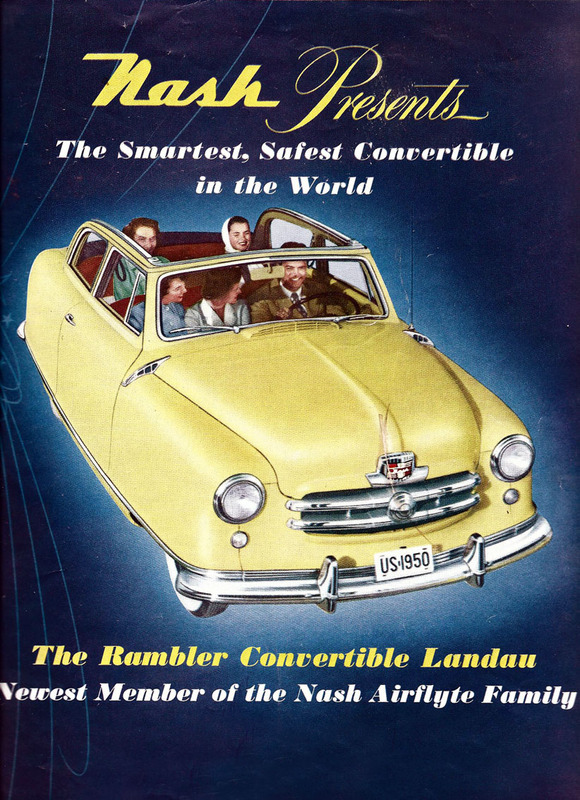 Instead, the first Rambler was offered only as a convertible. Although kind of an unusual convertible, one whose top slid down past fixed side pillars and roof-edge railings, making something of a cross between a convertible and a two door sedan. Actually, this wasn’t the first Rambler either, strictly speaking. 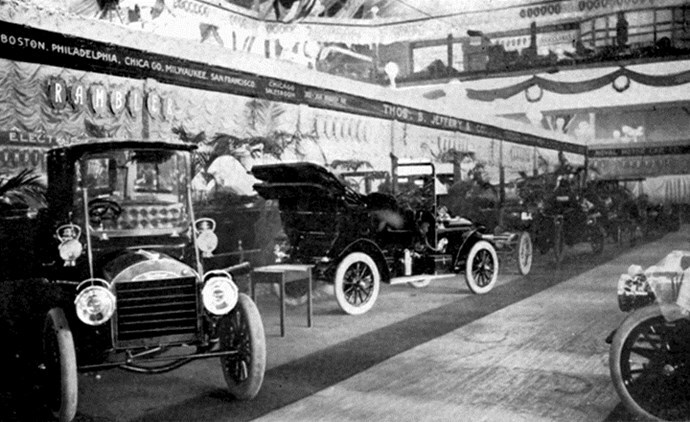 The very first car put out by the Thomas B Jeffrey Company in 1902 had been called Rambler. 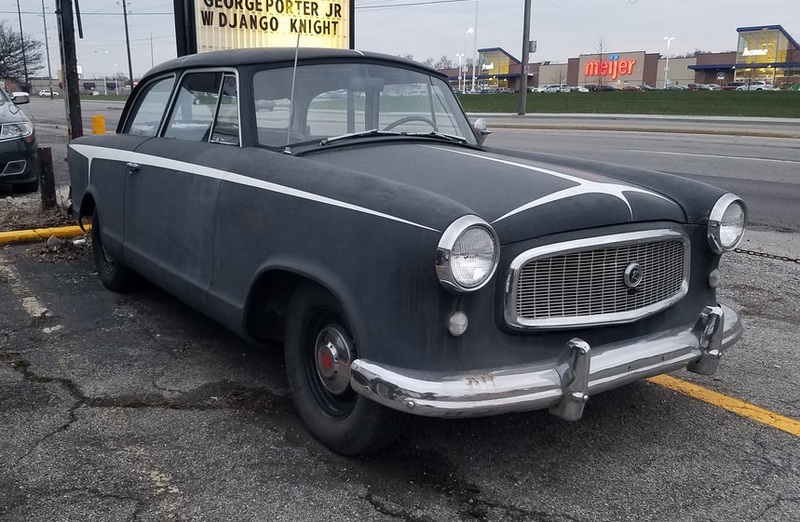 That first Rambler kept the Kenosha, Wisconsin manufacturer in business long enough for Charlie Nash to buy it after he washed his hands of William Durant (and the presidency of General Motors) in 1916. The Rambler went away then in favor of cars named after the new owner. But then Nash Motors (as with AMC after it) had a uniquely frugal way of keeping things around for use later. 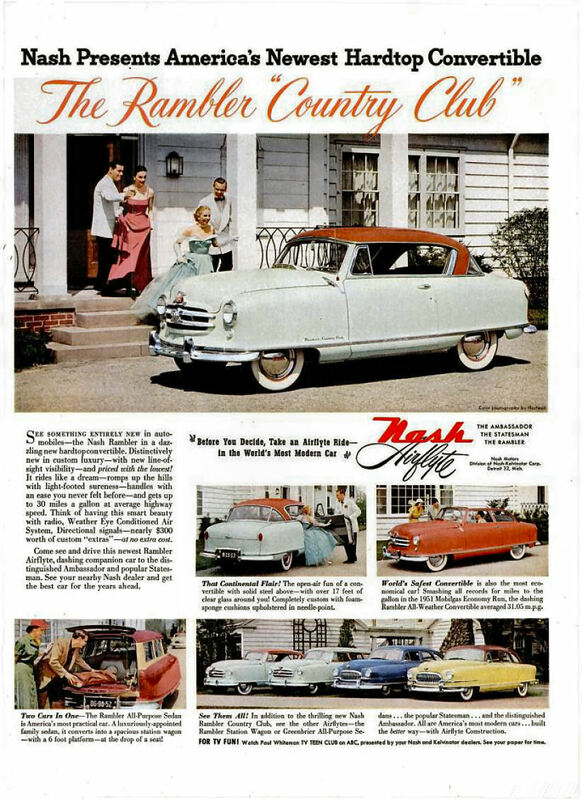 The 1950 Rambler didn’t set the world on fire, but it was far from a failure. 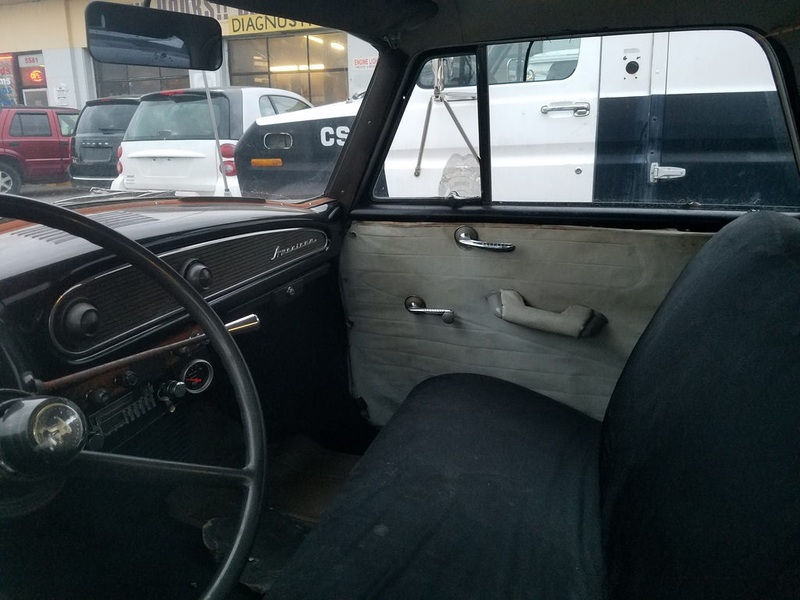 No bargain, this version of the Rambler was priced at $1808 and included whitewalls, wheelcovers, a clock and a pushbutton A.M. radio as standard equipment. 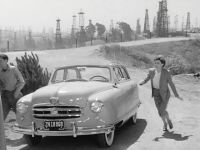 9,330 units out the door after a mid-year introduction was not bad, especially considering that it trailed full-year production of the similarly priced Studebaker Champion convertible by only about 30 units, in what might have been the Stude ragtop’s best year ever. It was joined by a two door hardtop and a two door station wagon in 1951 and remained in production through 1955. In 1956 the relatively new American Motors Corporation brought out an all new line of Ramblers. This was a larger and much more modern car that came in a full complement of body styles and engine availablility, including a hot new V8. The following year would see the end of the Nash and Hudson names as the old senior cars were killed off. Henceforth, these new Ramblers would take the lead in carrying the company against Detroit. 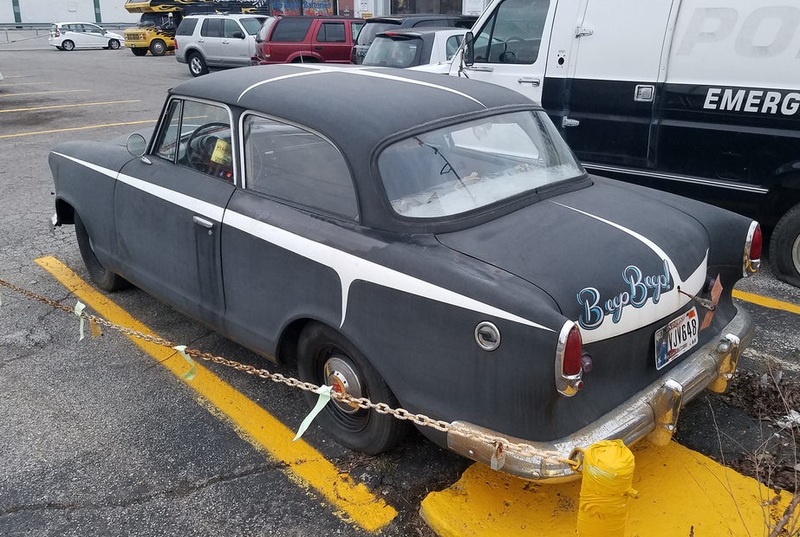 Yes, the 1955 Nash (and Hudson) Rambler that had been in its sixth year of production when it was finally euthanized in favor of the flashy new model. It was Romney’s good fortune that Nash had finally added a two door sedan to the lineup for what was supposed to be the car’s final year. 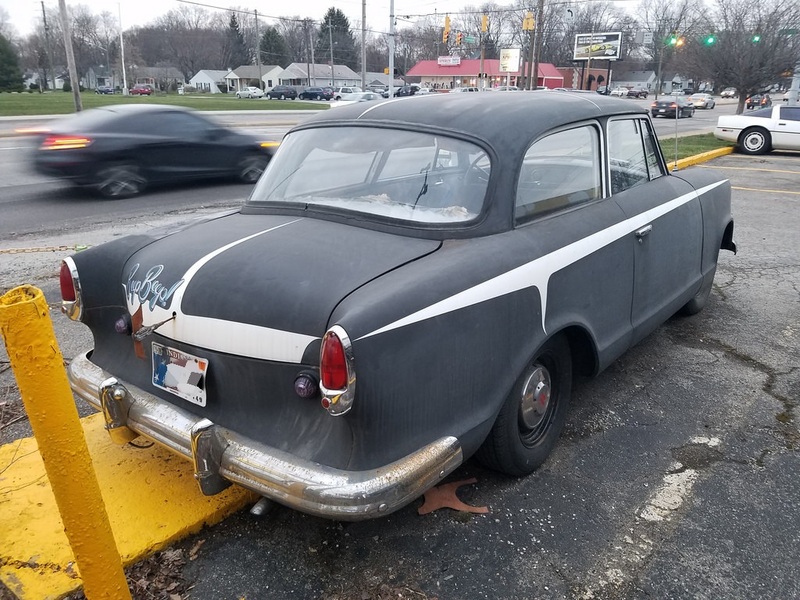 The ’55 version also got re-tooled front fenders that finally exposed the wheels so that the thing did not look completely like the old Nash Airflyte. All that was left to do was dust off the 2 door sedan, strip it of all of its DeLuxe features and sell it cheap. 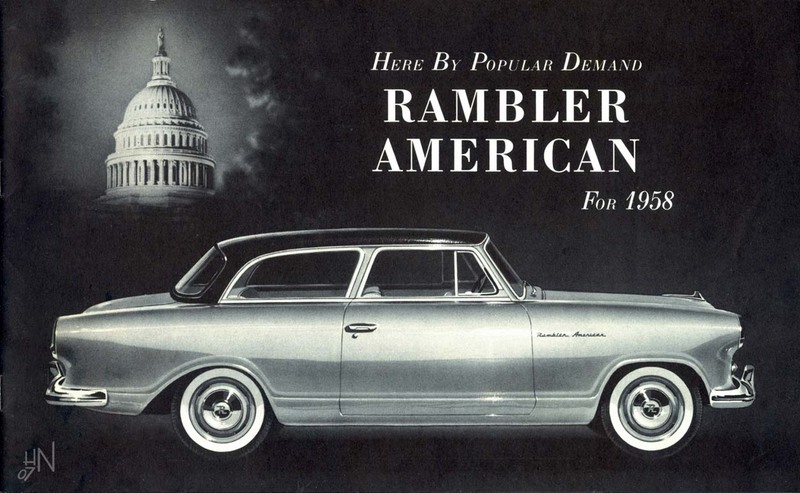 Introducing the “new” 1958 Rambler American. The only parts of the car that may have actually been new were the rear quarter panels with the fabulously oddball rear wheel opening shape and the cheap flat mesh grille. Oh yes, they also turned the taillights upside down. At a base price of only $1789 it undercut the Chevrolet 150 by a skosh over $300. The new American was even $6 cheaper than the bargain basement Scotsman. After a late 1958 introduction the American was good for something over 30,000 units of volume. After the two door wagon came back in ’59 production tripled. With the four door sedan joining the party for 1960, something like 124,000 Americans were built, a figure that surpassed the entire output of the Studebaker Corporation that year. 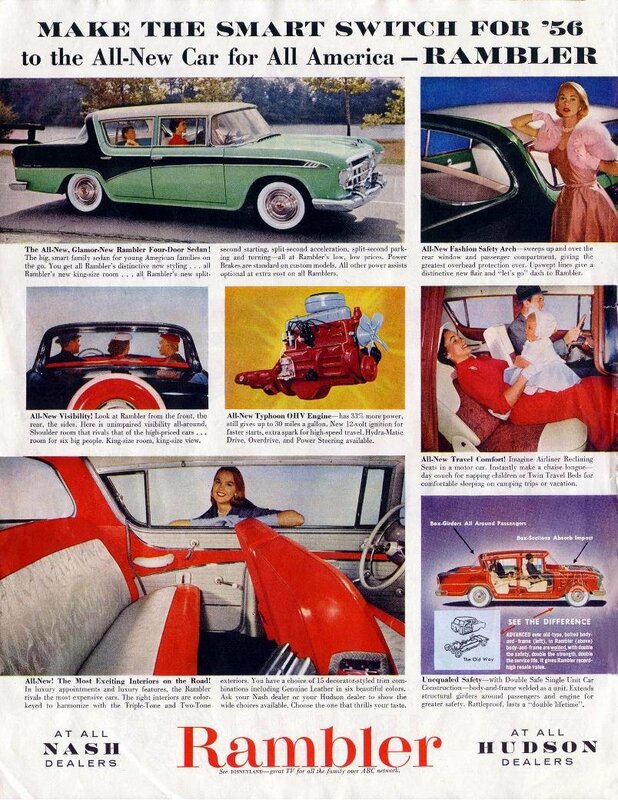 That sedan, by the way, was one of the few instances of some actual new engineering for the American, in that it shared the two door cars’ 100 inch wheelbase rather than the 108 inch span of the 1954-55 Rambler sedan. For those who have never listened to it, the Beep Beep song was a novelty tune that involved a guy driving a Cadillac, surprised at being overtaken by “the little Nash Rambler” that kept honking its horn, all despite the Cadillac’s faster and faster speeds. The punch line that finished the song was that the Rambler’s driver passed the Caddy at 120 mph. It turns out that he was only trying to ask somebody how to get the Rambler out of second gear. It was a funny gag because everyone knew that the Rambler, with its ancient “Super Flying Scot” flathead six, could in no way hit triple digit speeds short of being dropped from an airplane. At a 90 bhp rating, the 195.6 cid mill (3.2-ish liters) was even weaker than the smaller and equally old 185 cid (3.0 L) Studebaker Champion flathead six of 1958 which was good for a muscular 101 horses. The song could have more realistically substituted a six cylinder ’58 Plymouth for the Cadillac because the lighter Rambler might have at least had a chance against that one. But who would want to listen to a song about a race between two ancient wheezing flathead sixes? It should come as no surprise that the Beach Boys never sung about one of these. This American offered car buying Americans a state of the art new car at an attractive price. If state of the art was measured by Nash from 1950. The same old unit body, same old Nash trunnion suspension and the same old Nash flathead six were not exciting, but they were all known quantities which proved to be increasingly popular in uncertain economic times. The good old 3 speed stick with optional overdrive gave the plain little American some appeal as basic transportation. 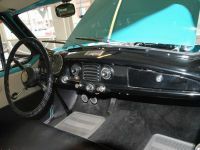 The addition of an optional Borg-Warner Flash-O-Matic transmission undoubtedly made the American appealing as a second car for the person then known as “the little lady”. This particular American is an interesting combination of stock original and rat-rod with its flat black paint and snazzy paint stripes. Of course, the artist behind the graphics would be sued for artistic malpractice if he had not included some reference to Beep Beep on the car. If they are original, the padded armrests might identify this as one of the Americans that came in “Super” trim. So this might have been the luxurious one. What year is it? I have no idea, so perhaps some real AMC fans can enlighten us on the difference between the ’58, ’59 and ’60 versions of this car. I cannot, so let’s split the difference and call it a ’59. Speaking of AMC, American Motors had a bit of an identity crisis in this era before “AMC” became the commonly used brand name in the ’70s. I can recall never being quite sure what to call these. OK, everyone knew they were Ramblers. 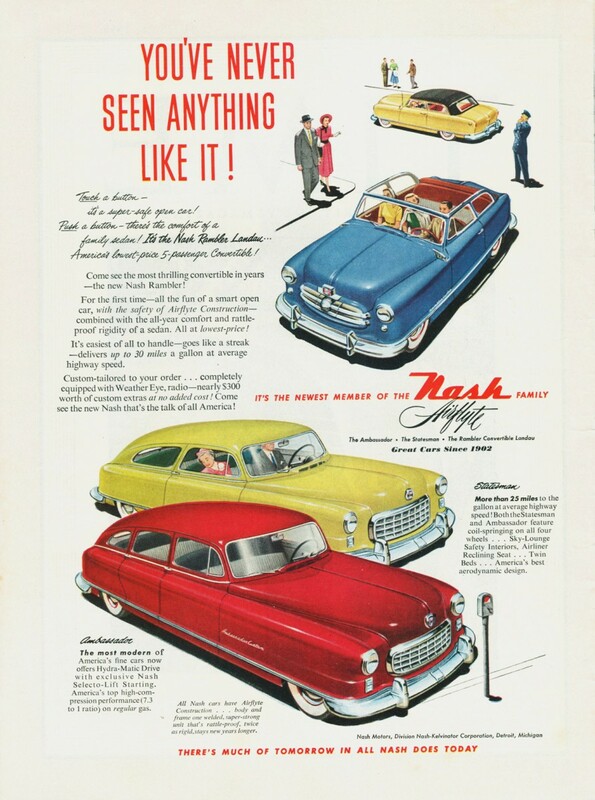 But like Ram and Imperial, everyone also knew that there had once been a real brand name (Nash) in front. Was the company Rambler? American Motors? AM? Or just American? So this was an American American? Or a Rambler Rambler? I guess this really didn’t bother that many people because in the grand scheme of things Rambler was such a puny player. Or maybe not all that puny because Rambler (as a whole) made it to sixth place in the industry in 1959 and fourth place in 1960. That was actually kind of a lot of Ramblers. Or Nash Ramblers as a lot of people were still used to calling these back then. The American would prove popular enough that it would get a thorough restyling for 1961, although the basic car was still pretty much the same ancient car under the awkward new lines. Was there really no money to re-do those rear fender openings? Buyers of an American would not really join the mainstream (to the extent that anything from AMC could be considered mainstream) until the all-new 1964 car that would anchor the lineup before the 1970 Hornet would come along to finish things off for American Motors as an independent company. Still, I prefer the honesty of this one to the later cars. “Sure it’s old, but it’s good and it doesn’t cost much” would have made a good slogan if AMC could have borrowed Volkswagen’s advertising team. There is something about this little American that is uniquely associated with the Upper Midwest, something that shows a people who will make do with what they have and figure out ways to re-use old things. Waste not, want not, and all that. The final Hudsons were called Hashes (because of their recycled Nash underpinnings) and this little American was a bit of a hash as well, combining a whole lot of old and a precious little bit of new. But sometimes the old thing you have laying around in the basement can be plenty good enough. Good enough to inspire a song, even, which is something that a lot of bigger and more impressive cars of the late ’50s cannot claim. Beep Beep. Beautiful article, especially the emphasis on frugality. Minor point: Romney didn’t bring back the ’55 four-door, which had a 108″ wheelbase. The 1960 four-door was a new design on the 100″ platform. Thanks for that bit of info on the wheelbases, I cleared that up in the text. That 108 inch wheelbase ’55 sedan was an uncharacteristic bit of extravagance for frugal AMC if it was only offered for a single year. I would not be surprised if it was the basis for some of the underpinnings of the new 56 Rambler sedan. (Edit) The 4 door sedan seems to have come out in 54, actually. Only the 2 door sedan seems to have been added for 1955. I wonder if potential new car buyers back then even gave much though to how ancient the underpinnings of some cars were? Even today, how a vehicle looks and how well it fits a buyer’s (perceived) needs seem to be the top priorities when considering a car purchase. 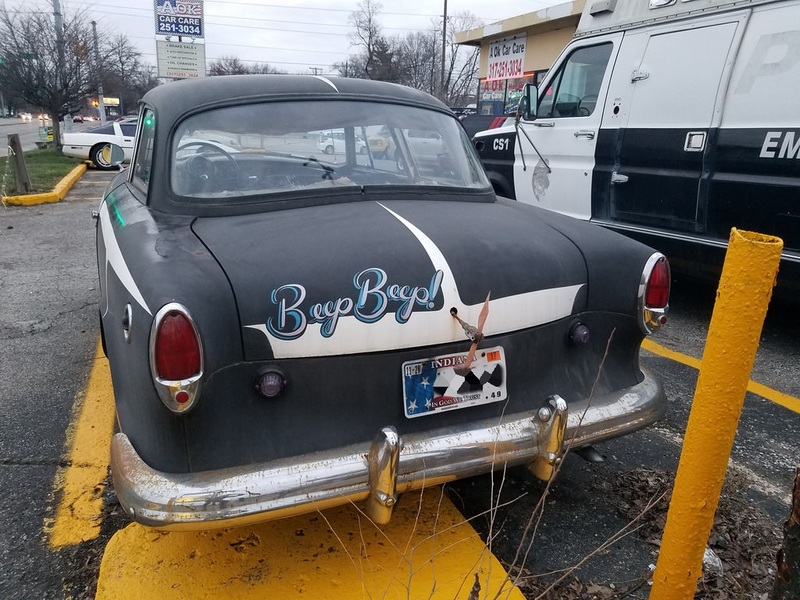 I had no idea that….this car’s manufacturer had gotten to 4th place in 1960. In the small town where I grew up, the Rambler dealer had the oldest and smallest buildings for it’s dealership, really just a converted gas station. A few folks drove Ramblers but there never seemed to be any owners of new models, it’s like the factory somehow delivered cars that were always at least a year or two old, or maybe it was something about the styling that made it difficult to notice a brand new Rambler? 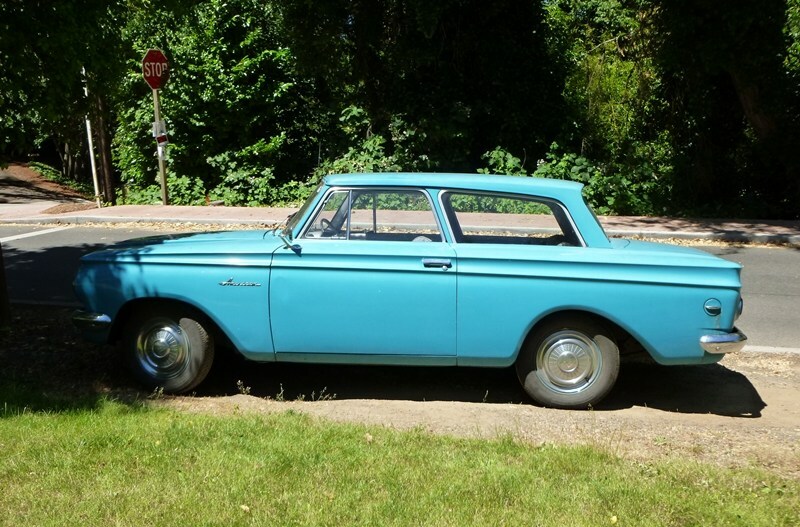 Rambler actually reached third in 1961, after Ford and Chevrolet, albeit with lower production than in 1960. I’m my hometown there was a dealer that paired up Rambler & Buick in the ’50s. This seemingly odd combo must have worked, as they survived until a decade ago selling Buick, Jeep & Chrysler. A most enjoyable, entertaining and informative entry, JP. A delightful car. The example you found wears the stripes quite well although the paint runs over the rear wheels are an exception. Speaking of manual transmissions on these, the treatment for the shift lever is a nice touch. The shift linkage is covered (a hat tip to Ford) and it’s not quite on the column and not quite in the dash. The operation is likely identical to any other, but it would be fun to give one a try. AMC’s timing was quite good with these given the soft economy of the 1958 to 1961 era. My memory may be faulty, but I seem to remember that the shift linkage on my family’s 64 Ford Country Squire with “three on the tree” was NOT concealed like it is on the car pictured here. I have a vague recollection that something French used the “ball and socket” column shifter ( for want of better description) Simca perhaps? Even as a kid, exposed shifter linkages looked cheap and nasty. The one on my parents, uncles, and both grandparents Hillmans stick in my memory. Hillman column shifts were shrouded after the Audax launched in 57, I looked at a 55 yesterday and noticed the linkage was exposed, but they were a basic car too very much along the Ramblers lines, you got what you paid for nothing more. You are correct the Ford shifter linkage was exposed until 1963. My sarcasm wasn’t my most effective ever. ? A very nice, Spartan looking vehicle. It looks like a full size version of a mini pedal car design you might see on Pawn Stars as an example. Rambler made decent cars through the ’60s but you had to worry that your neighbour who just bought a Chevy or Buick would diss you every day for buying one. I think the vast majority of Rambler owners marched to the beat of a different drummer and didn’t care much what anyone thought about their vehicle. They ‘liked’ being different (i.e., frugal), even if it was in a negative light. To them, a vehicle was a transportation appliance and if it looked a little goofy in the process, so much the better. I can easily see them as the same sort of people who might have bought a Pontiac Aztek. In fact, one of the best examples of car-casting was the wacky alien family in the old, great sitcom Third Rock from the Sun where many episodes would end with the four of them sitting in a Rambler convertible at night, reminiscing about the day’s events. Wow, it does look like a pedal car! It doesn’t help that they tried to update the styling multiple times as stingily as possible. Something that always bugs me when I see Nash reclining seats is how the pivot point is several inches above the place where someone’s back actually reclines. I can’t imagine anyone being comfortable for more than a minute or two with that set-up. Worse is how this continued well into the seventies as I vividly recall reclining seats on AMC products having the same malady. I mean, seriously, how difficult would it have been to have the pivot-point down in the seat cushion? 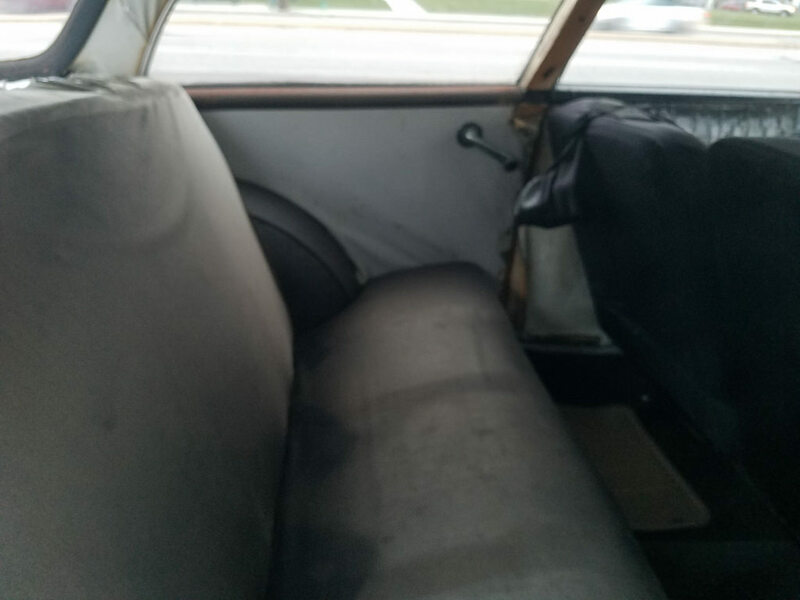 All I can figure is it’s up higher because the lower pivot is already in use for the cushion to fold forward to allow rear seat access in two-door cars. Always felt these were the “saddest” looking cars, even when new. A lonely mutt puppy. Interesting, but these don’t do it for me at all, I quite like the later Americans. Speaking of which, anybody seen the Tiki Rambler lately? Yes, I found that one and liked the animation, but I figured that for those who were unfamiliar with the song the fairly lengthy intro might have been confusing or offputting. I used one that was just a plain vanilla playing of the song. The best thing about that is that the animator included other AMC vehicles on the road. At around 1:10 a Pacer and a Gremlin pass by going the other direction. JP, did you photograph this car at 56th and Keystone? Over the past several years I have noticed some very unusual and interesting cars at this repair shop while driving north on Keystone. Yes, that’s the place. I have seen a few others there that I have wanted to photograph but have been pressed for time when I saw them. I used to ride in one of these every other week, when Dean Harless’ dad picked us up to take us to youth symphony practice. It was a somewhat depressing car. 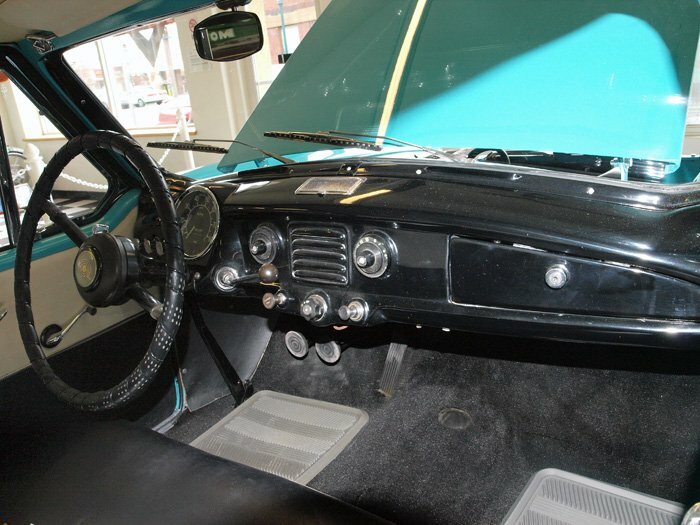 The late in 1964, his dad picked up its replacement: a ’64 Biscayne sedan, with the six and three speed manual. An improvement, but not exactly a huge one. It certainly was a lot roomier; these Americans are very cozy, especially in width. I’d say the interior is probably close to the same size as the Opel Rekord P1 we saw here yesterday. I’ve had my eyes out for one of these for years, to no avail. Nice catch. That width thing is interesting. I looked it up and these measure roughly 73 inches. It turns out that is five inches narrower than the AMC Pacer (“the first wide small car.”) But it looks like there is a lot of interior width lost to that thick, old body so I do not doubt that the interior is a bit tight. 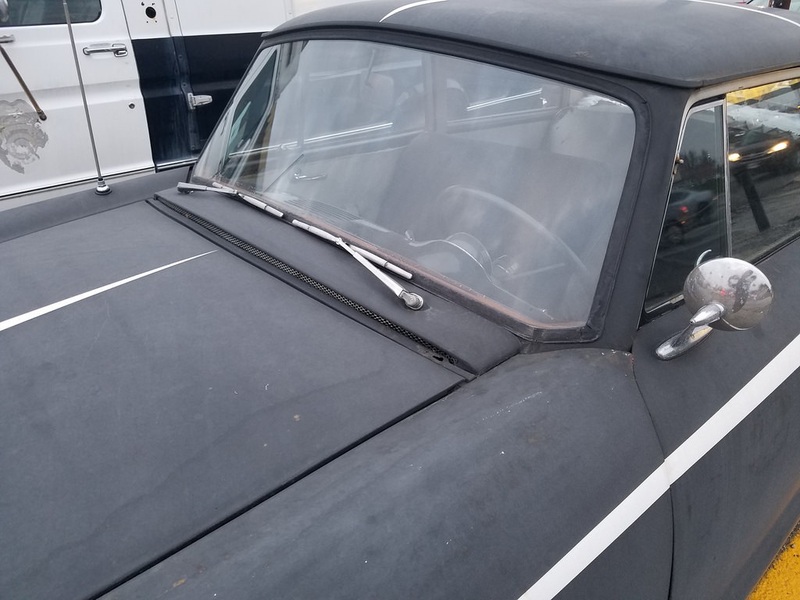 It is also about 1.5 inches wider than a Lark, but then Studebaker’s doors were always pretty thin so it is likely more roomy inside. I have now become quite fascinated by that one-year-only 55 Rambler sedan on the 108 inch wheelbase. I will get to work to see if I can find one of those. Well, yes, that body was quite wide, especially at the bottom, as it originally had to be wide enough for those front wheels to turn inside those faired front fenders. But yes, it was very space inefficient. I’d have to look up the specs, but I’d say it was considerably narrower inside than a Lark. A neighbor had one, and I rode in it a number of times; it felt significantly wider. I just noticed something really strange: Rambler couldn’t seem to come together on the design of their logo. 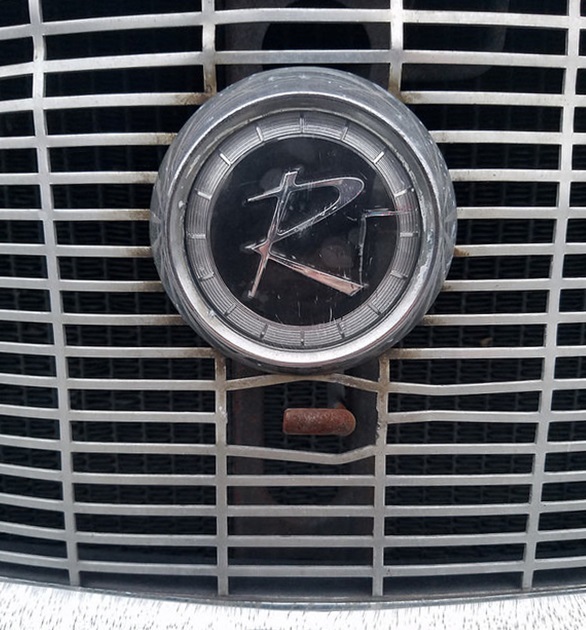 The “Rambler R” used on the grille badge is markedly different from the one on the hub caps. I would love to know the story here. Anyone? I just answered my own question. 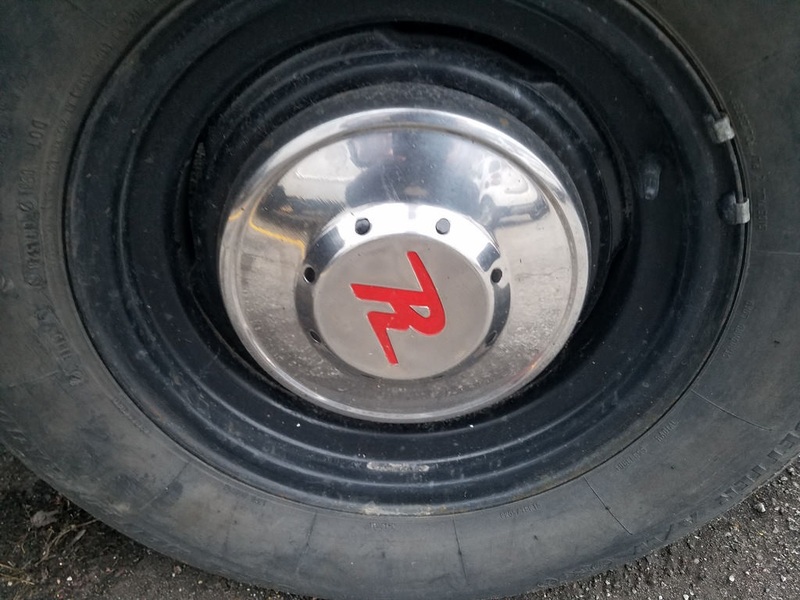 It appears that the hubcap R was from the stamping equipment that had been stamping an “R” on Rambler hubcaps since at least 1954. The “R” on the grille seems to be an addition that came in either 1958 or not long before and made it onto hubcaps through most of the 60s. 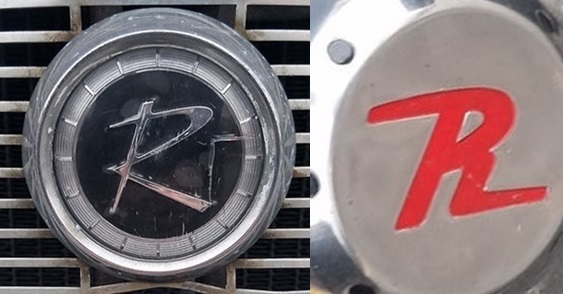 That red R is clearly older, from the early/mid 50s, so it must be an older hubcap design. 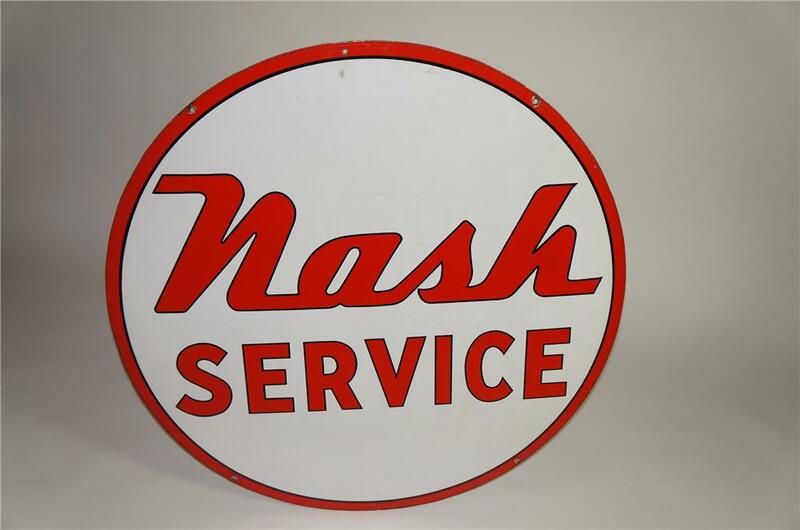 My Dad was briefly a mechanic for a Nash dealership in the early 1950’s. Somewhere around here I have some memorabilia from that work stint, including a red Nash logo from a work uniform (remember those?). The Red R is from that era, for sure. Thanks JP for a enjoyable look at these cars. I’d forgotten the “Beep Beep” song. One of the elders in our Boy Scout troop had one of these Americans. I thought it looked so homely at the time. I somehow escaped riding in it. I always associate the Nash convertible version with the TV series Topper and an episode called “The Car Story”. Don’t ask me how I remember this stuff. This was hysterical! I hadn’t thought of Topper in years, I loved that program as a child when our TV was first new in the early 50’s. What a great memory. In high school about 1963-64 when we all first learned to drive a friend would bring his family’s ’59 Rambler to school occasionally, then a bunch of us would pile in for a ride home in the afternoon. We would regularly stuff 6 or more of us into that little thing, don’t ask me how we did it. Nobody cared what a basic oddity this car was, even then, as long as we had “wheels” and could avoid taking the bus home. And how I remember that “ball and socket” gear shift lever, didn’t the big Nashes have that, too? A very enjoyable read, thanks for reviving a fun memory. The big Nashes certainly did have the ball and socket gear shift lever. Our 50 Ambassador and 52 Statesman had it. But so did the little Metropolitans (example below). I appreciate your view of having an old Rambler for a ride vs. the bus but I’ve known several people over the years who were forever traumatized in high school by having to drive the family’s pass down car, one of these old Americans:-) One of these individuals, today nearly 80, continues to drive “hot” cars because of that past stigma. I’ll never forget when she got her first new 300ZX with five speed because it was about as far as she could go from the memory of that Rambler American. 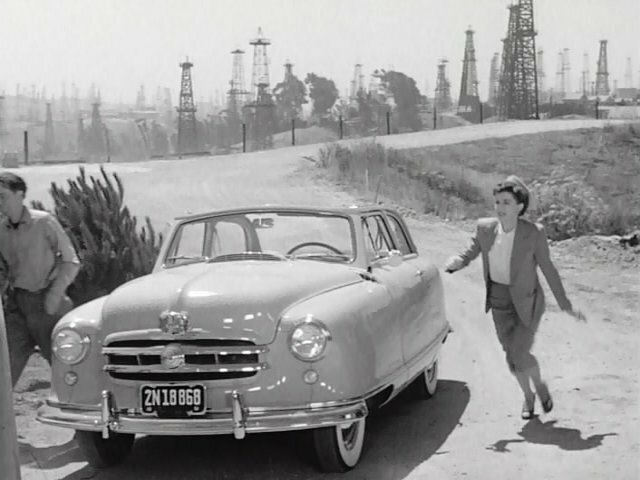 Lois Lane drove a ’51 convertible in the old Superman TV show. Man, you could do anything in the 50’s. You could bounce a baby on your lap while you drive?!! – My mom often called AMC cars “Nash Ramblers” long past the early ‘60’s, probably well into the Hornet era. – I don’t think I ever rode in one of this generation, and my strongest memory is of an also black one (but still quite glossy after 10-15 years) that belonged to our Russian Orthodox priest. It went well with his traditional black robes and headgear. The first time he pulled up in front our house for the annual blessing in the American’s replacement, a yellow Corolla, it was extreme visual dissonance. I suspect many Americans were replaced by Corollas or Datsun 1200’s or B210’s. – I did briefly drive a next-gen American. It belonged to a woman I worked with and I was trying to help her get it running better … it was a lost cause. This was in the early ‘80’s and even with the boxier styling it seemed hopelessly old, and not in appealing way. BTW, interesting that the competition for the American was a Scotsman, but the AMC motor was a Flying Scot. I guess it was possible for the Scottish reputation for frugality, and an evocation of the name of the high speed train, to coexist in our minds in those days. That’s what I’ve heard them called a lot; the “Ramber” name seems to go way back to the beginning of the company, the “Nash” seems to have disappeared before the “Rambler” name itself did around 1969 or so….but Nash seemed to be well known and have a good reputation among people “of a certain age” who associated the name even with follow on cars after the company stopped using that name (would be like referring to an “AMC Eagle ” (not the model Eagle, the Brand Eagle” or even “AMC Chrysler” or “Hudson AMC”)? My parents bought two Ramblers in a row, both station wagons, when I was a little tyke…they called them “Ramblers”…I don’t remember many people referring to the brand of their car that way as “I have an AMC”…instead, “I have a Rambler”..I think the first one was a ’60 that my Father bought in Compton, California…we drove back east in it when he got a job at Westinghouse..man, I’ll bet that was a head-scratcher for some people, someone leaving southern California in 1961 for Pennsylvania…talk about bucking the trends (if instead people would have wanted to go to Florida or Hawaii, but certainly not the mid-Atlantic especially at that time). Yes, my mother called these “Nash Ramblers” too. Just like I still say “Dodge Ram”. Interesting that in the first Nash ad, the Ambassador is parked in front of a meter and the red time expired flag seems to be up. Why on earth would an ad man show a parking meter in a car ad, let alone an expired one? I’d guess the parking meter was meant to make it look more like a real world scene, since the scene looks like it’s meant to show the new Nashes on the street being admired by passers by. But you’re right, it looks like the meter’s expired! Perhaps the artist thought the red added a touch of color. A friend of my dad’s had one of these in the early 1960’s. It was mint green (or whatever those really popular light greens from the 50’s were called). I never rode in it. I think he used it to drive back and forth to work. 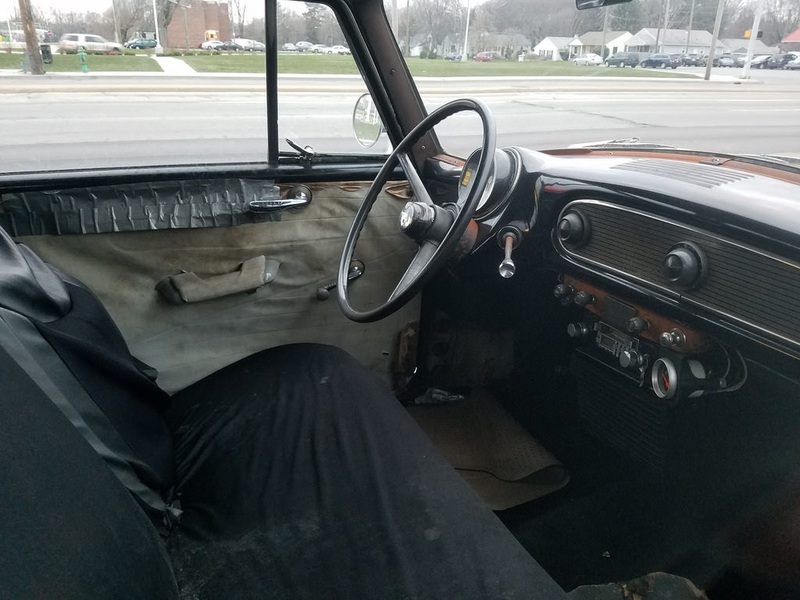 My ’62 Metropolitan had the ball and socket on the dash for its 3 on the tree. Even as a teenager 40 years ago, it seemed like a tidy way to hide the linkage. My Dad’s ’64 Dodge pickup, as I recall, not so much. You just better hope they don’t send that police van next to it the next time you call 911…..! Thx for the flashback. Our blue ’59 American was the 1st car I every drove and the one I took my driver test on. The very definition of uncool during high school in the 60s. Ours had one option. A heater. I remember reading (owner manual I think) Ramblers could be ordered with “bedable” reclining seats. The difference was that they fully reclined onto a bracket that held them level with the rear seat cushion. My brother and I used to fantasize about having that option at a drive-in movie. An even bigger fantasy would have been getting to actually go out on a date in that Rambler. To dream the impossible dream. . .